Held as part of the IFBB English Grand Prix event, this section brought together the best amateurs in UK. It offered a Pro card to be won, and immediate entry into the Pro Grand Prix that night. Won by Dennis Francis. 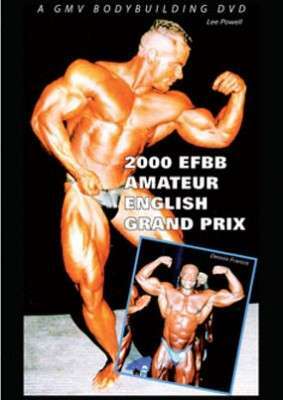 Held as part of the IFBB English Grand Prix event, this amateur section brought together the best amateurs in UK. It offered a Pro card to be won, and immediate entry into the Pro Grand Prix that night. It was a wonderful victory for Dennis Francis, a former Mr Universe winner. Dennis is pictured lower front cover. Lee Powell is pictured upper front cover. The DVD includes all the competitor introductions, compulsory poses, comparisons and posing routines of all 10 outstanding competitors. Also posedown and awards, as well as an interview with overall winner DENNIS FRANCIS.